I used stash yarn (Montera by Classic Elite) and made it up as I went along using a basic mitten structure and made it as big as I dared. Then I added a couple of trees knitted out of Nicky Epstein’s Knitted Embellishments (I love this book) and added a few beads for “lights”. It was fun and I think it came out great. 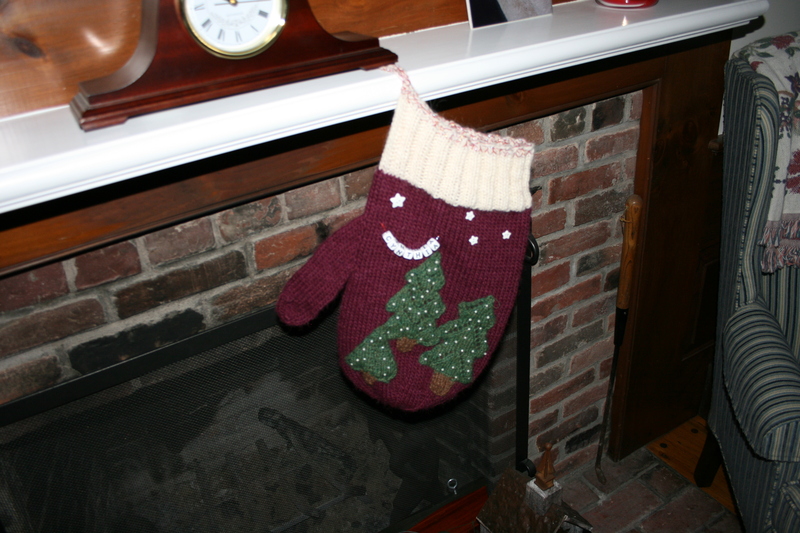 I spent a lot of time trying to figure out how to put my name of the mitten, I am not totally pleased with the results (beads with letters) but it will do. They were fun to make. I need to tie on a ribbon or something tonight. I also have a pot of Carrot Soup to bring. I have also been dying and knitting. 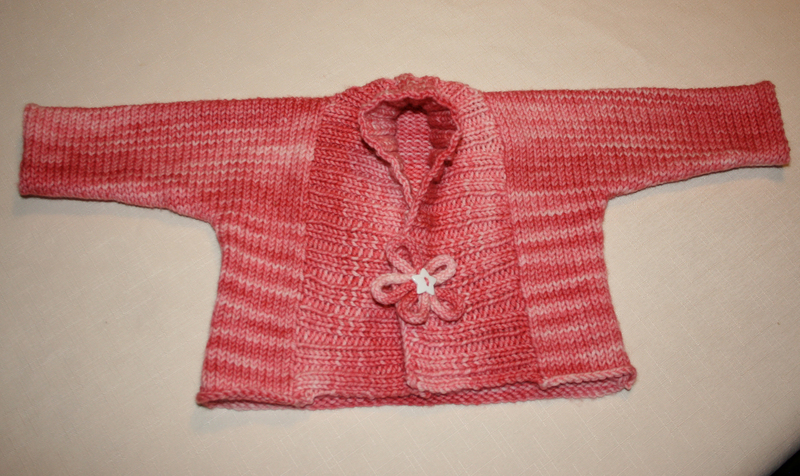 I knit a Ribbed Baby Jacket for a friend to give to a friend who is having a baby. 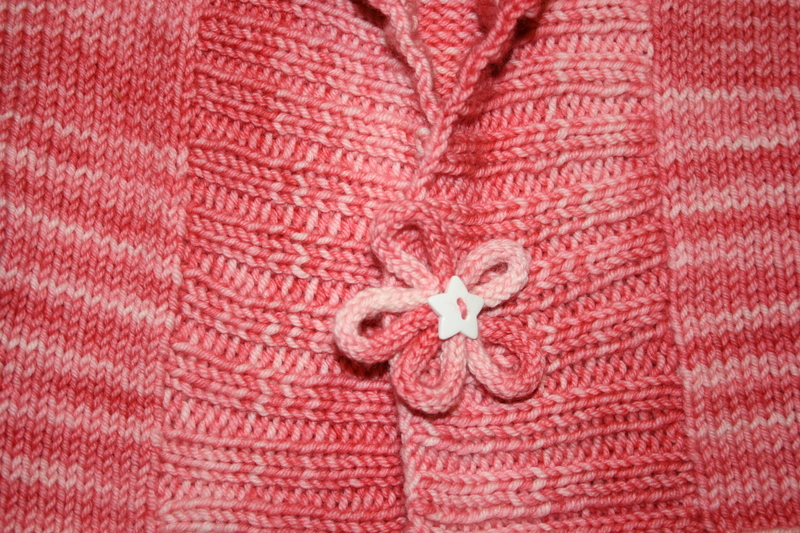 I used Wool2Dye4 worsted weight superwash wool which I dyed a pinky/peachy color. It is an easy pattern that I got on line but when I was putting into Ravelry it says it is a Debbie Bliss pattern. I made a simple I-cord flower and put a small star button in the center. 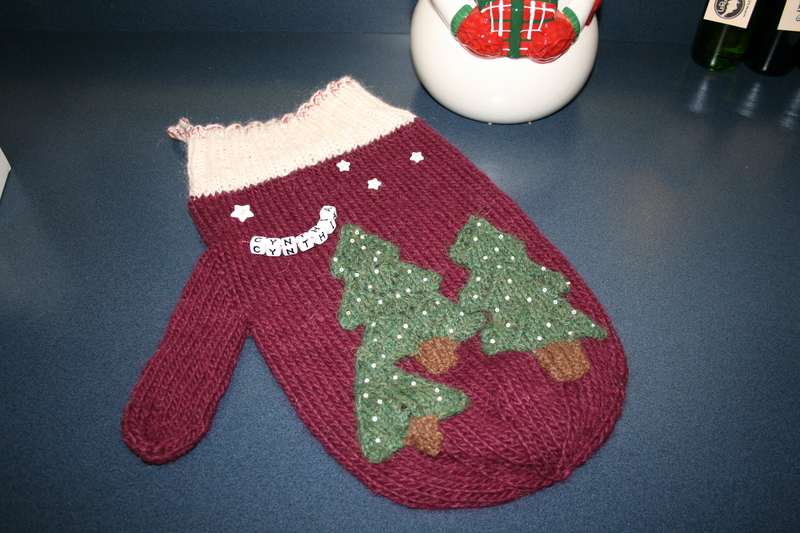 I hope to get a picture of the baby wearing the sweater (after she is born!). There is also a couple of balls of brown alpaca pencil roving I dyed and a couple of braids of top (one is merino/alpaca and the other is superwash merino). David and I spent a couple of days in Portland Maine this week. It is our annual trip, the week of his birthday. We eat at great restaurants and shop for Christmas. We make a pilgrimage to LLBean and this year decided to send gift certificates for the kids in Texas. And we ordered the annual Gingerbread Houses. We are getting the bad weather today that has swept across the country. There was a little snow and freezing rain overnight, today it warmed up and has been raining hard. I do hope we get snow before Christmas, but just enough to make a white Christmas. “We cannot live only for ourselves. 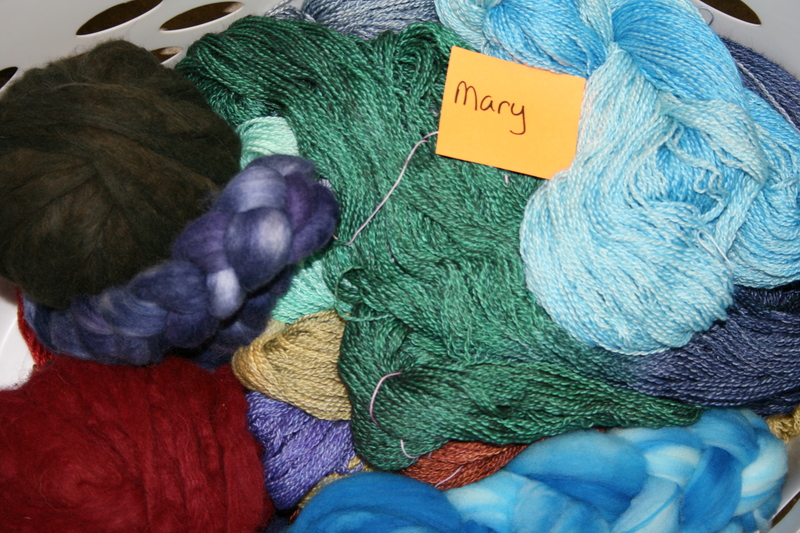 A thousand fibers connect up with our fellow man.” Herman Melville. I WOULD LIKE TO INVITE ALL VENDORS TO COME CHECK OUT OUR FLEA MARKET THAT IS OPENING ON THE 10TH OF NOV BUT WE ARE SHOWING VENDORS SPOTS NOV TH BETWEEN 12 AND 3 PM PLEASE COME CHECK IT OUT. BIG INDOOR and OUTDOOR Flea Market OPENING Nov 10th we have spots available and ill be showing the spots Nov 6th 12 til 4pm 165 Front street the old mill building by city hall.Text me to confirm 413-328-1911 or call me. Thursday threw Sunday 4 days if you work thur and Friday I would suggest you open for a couple hours when you get out of work .Auction will be the first Wed of the month, I suggest if you have items that are not selling auction them off and bring in new stuff that sells. We are all here to make money, I have a list of wholesale company’s you can order stuff from they also list the hot selling item at the currant time ,if you need the names please ask me. Another suggestion a lot of people use debit cards it does increase your sales, there is the square it plugs right into your phone and you get paid the next day also you don’t need a checking or savings account please see me for more info on the square. 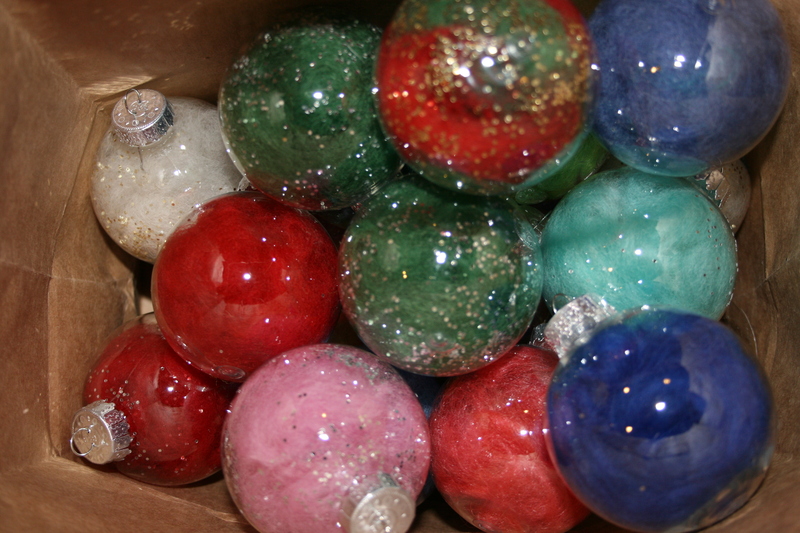 There will be live entertainment, Kids game rooms , Concession stand, Live bands, Open mic night ,Pictures with Santa, Antique shops, clothing, shoes hand bags jewelry, new and used shops Professional Glass blowing on site, they can make just about anything you want he does wine glasses, pipes, ashtrays, clocks etc, for gifts for that hard to buy for person. Every weekend we will have something new going on come check it out. We will also be doing charity raffle’s each weekend there will be something for everyone. We will be advertising the Flea market everyday on 3 radio stations Rock 102.3 – 99.7 and our a local Christian station. Your store will be in the flyers that will be handed out by the parking attendant. Spots Starting at $20 to $30 – with electric .units will all be locking units you will be able to lock and leave your stuff there .there will also be 24/7 camera surveillance. required to move in , come secure your locking unit now. No more dragging your stuff in and out everyday. Text us to set up a time to come see the units.